Photo by Philip Morgan, no reproduction without permission. Philip Morgan took a series of photos on the viewing day in November 2004, preceding the auction to sell off the fittings at Pebble Mill, before the building was demolished in 2005. 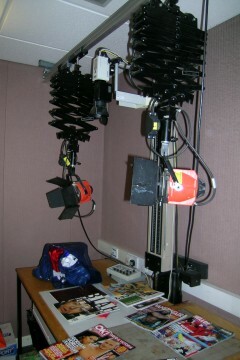 This photo is of the graphics rostrum camera. The fixed camera was used to take shots of stills from magazines or photographs. You can also see a couple of redheads to ensure that the lighting was right.